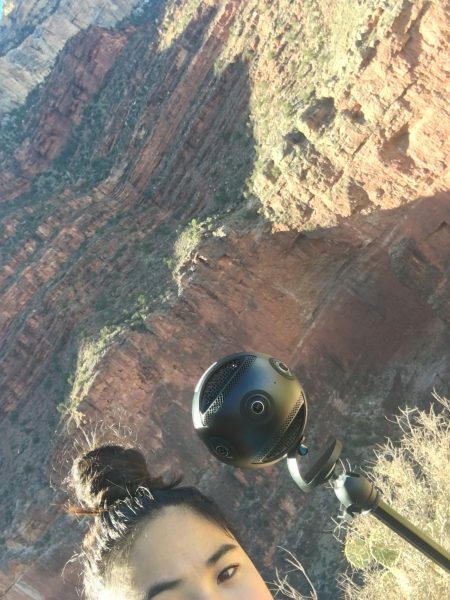 Insta360 continues to takeIndividual instance of a shot; a take = each time the camera is started and stopped. the 360-video industry by storm, not only with its mobile friendly devices, but also with higher-end ones. 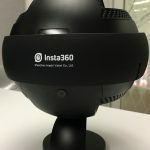 Although they had quite a few impressive announcements at CES this year (10K 3D pro and Nano S), I did finally get to spend some quality time with their Insta360 Pro late last year. The Pro has six fisheyeAn extreme wide-angle lens, with image distortion occurring at the edges of the frame. lenses (6 x F2.4), four built-in mics (plus AUX port), a collection of input ports (HDMI 2.0 Type-D, RJ45 Ethernet and USB Type-C) all in an aluminum alloy and polycarbonate shell that’s the size of a melon (φ143mm) weighing 2.7lbs or 1228g. It’s powered by a 5000mAh removable battery and/or 12V 5A DC adapter. Among the different ports, one that caught my eye was the USB-C, which means you can record your footage on an external hard-drive, no longer being limited to SD cards or the breaking up of files when they pass a certain size. All of this for $3,499, significantly less than other cameras capturing with these specs. 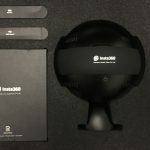 As a stitch snob, I was really impressed with Insta360 Pro STITCHER’s optical-flow stitching. Not only was it done well, but it was also done fast in-camera as well as on desktop. The camera also comes inside a hardshell portable case that makes traveling with it a snap. If you know me, I am not one to read the manuals, and the Pro stays on brand with how easy it is to use. From the interface/buttons on the device to the Camera control app, that allows you to monitor and control the camera’s setting from your devices, it is ridiculously simple. 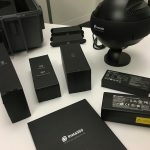 NOTE: Do not get overwhelmed by Insta360’s FAQ workflow chart that nearly made my nose bleed! Similar to cameras like the Z Cams, the Pro is literally point and shoot when it comes to capturing. It’s accompanying app allows you to easily monitor your shot and makes tweaking the settings a lot more simple than other cameras. Unlike the Z Cam S1 that has one button to turn on/off and another to record, the Pro has the ability to change the camera easily either directly on the device or through the app. For example, I have never tweaked my Z Cam settings – either through the etherport or through their app – mainly because it feels clunky and complicated, and the footage comes out great as is. The Pro, however, makes it simple to switch between quality settings or go from video to photo to live mode. In addition to the on-camera buttons and app, you can also switch the settings through QR codes generated by the app. Easily select your settings, hit record, and hide. I did notice there was nearly a 10 second delay from when I hit “stop” on the camera through the app until the camera actually stopped recording. The one new thing compared to other cameras is calibrating the Pro before you shoot your scene. This step can takeIndividual instance of a shot; a take = each time the camera is started and stopped. a few minutes, but you do this to help optimize the stitch it’ll produce afterwards. I calibrated every time I was in a new location or moved the camera significantly. I didn’t have it long enough to compare the calibrated and uncalibrated footage, but why not invest a few minutes and make sure it is calibrated to the scene? I tested the camera by taking it to the Los Angeles Flower District and captured scenes with different settings. The simple interface to switch settings and stitch made recording in stereoscopicVideo shot with two parallel cameras (or in the case of 360° video, multiple pairs of parallel cameras) Commonly referr... More/3D is a breeze. Here are two scenes I shot. This two minute video took about 5:40 mins to stitch via Insta360 STITCHER. For me, using the 4K mono produced the best results. But, here are some realities. 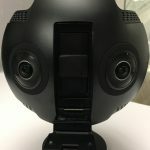 Although I was blown away from the ease of use and general quality of the stereoscopicVideo shot with two parallel cameras (or in the case of 360° video, multiple pairs of parallel cameras) Commonly referr... More images and videos, I noticed I did got nauseous viewing the 3D video results. It could be because of my hardware playing it back, but I don’t think so. 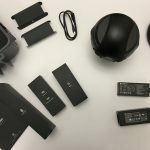 I viewed the footage via my Alienware Aurora Desktop (Intel Core i7 – 16GB Memory – NVIDIA GeForce GTX 1080 Ti – 256GB Solid State Drive + 2TB Hard Drive – Epic Silver) and HTC Vive. Turning, looking horizontally along the y-axis was fine. It was when I moved up and down the z-axis, as if adjusting my height, that it felt off. Tilting my head to the side also had issues. Again, although stitching was impressive, there are a couple things I missed from using Kolor’s Giga. You can’t rotate the camera’s horizon in the Insta360 software (you can do that in post with Adobe Premiere and other post software), which would allow me to change the default horizon when I hung the camera over the rail. The default footage was facing down, rather than out. There is a strong fan hum from the camera, which gets filtered out by the stitching software in the final video. You can also change the settings so the fan doesn’t run at certain times. In my time with the Pro, recording in 10-minute or less bursts, the camera did not heat up… so overheating wasn’t a concern while I used it. I didn’t get a chance to test live streaming from the camera, but Michaela A. Holland, Associate Producer for LIFE VR at Time Inc., did. 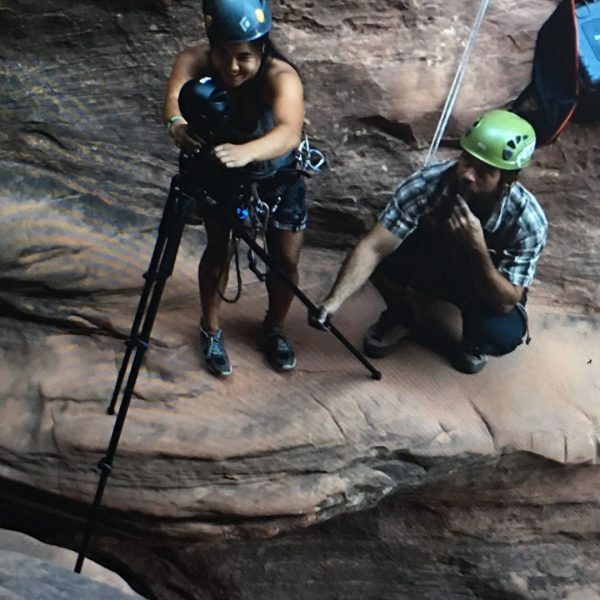 “I shot canyoneering in Zion National Park, hiked with it over 12 miles in the Grand Canyon, and let it roast in the heat of August for a two and a half hour 360° live stream of the Great American Solar Eclipse,” she told me recently. She did say that the app isn’t the best for long distance hiding and she also told me that she doesn’t bother with stereoscopicVideo shot with two parallel cameras (or in the case of 360° video, multiple pairs of parallel cameras) Commonly referr... More/3D. That said, it’s become her go-to camera. My students and I love our Z Cams, but – as hard it is to believe – the Pro may have dethroned the Z Cam S1 for us. Although it can capture in stereo, I would use that more as a bonus rather than the main reason for the camera. For the journalism work that we do, mono has proven to be a solid option and doesn’t make people sick. 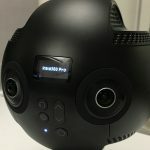 The Insta360 Pro is a strong camera for the immersive storyteller that is ready for the next level in quality – even if some HMDs can’t handle them quite yet. 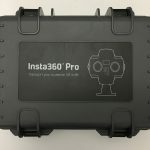 Affordable, easy to use, solving stitching… the Insta 360 Pro is a great camera for beginners to pros.